The chile, it seems to me, is one of the few foods that has its own god. Cooking is one of my great pleasures. I enjoy nothing more than creating food that enlivens the palate, invokes strength of flavor, and speaks of refined textures and seductive and sensuous aromas. Spices, herbs and aromatics are to me like pigments to a painter - to be mixed in an endless variety of alchemical compounds, elixirs, and infusions. But spices, herbs and aromatics go beyond the pleasures of the palate. Historically, in early trade, spices often took the place of currency, they have played important roles in the healing arts, adding properties to medicines, bringing scent to perfume and used to enhance our seductive qualites. The flavors brought by these botanicals also become synonymous with location - certain foods evoke immediate recongnition of where they originate, and the mythologies and imagination we associate with with these faraway places. Spice has for much of history traveled where we as individuals could not, or have not. I have never been to Shanghai, but if I close my eyes I can vividly imagine salty caramelized roasted pork sticky with a sweet plum, soy and start anise, served from a street vendor surrounded by wafts of fragrant smoke. Cuisine is, in my mind, just as much a medium for expressing culture as is art, literature or music. Wavery Root suggests that, "every country possess, it seems, the sort of cuisine it deserves, which is to say the sort of cuisine it is appreciative enough to want". American cuisine, unlike our current political climate, is incredibly welcoming and diverse in it's acceptance of foreign tastes; at once the result of our diverse population, and a growing acceptance of foreign flavors and cooking techniques. Americans prize our diverse culinary traditions even when we might not welcome those who introduce them - a fact that I have a very hard time accepting in this time of war and distrust. Anglo America - that culture of the "Founding Fathers" was not what America has become - Our fore bearers preached austerity, blandness and economic practicality at the expense of indulgence and taste. It was over and over again in this country that the lower economic classes and immigrants introduced Americans to the flavors of the world outside it's borders; new and rich flavors which America has thrown, with more relish into it's famous "melting pot" than it ever has any other the cultural products introduced by the "huddled masses yearning to breathe free". When I started Chilefire in 2005 I selected the name - to speak to the topic of spice, for exactly that reason. Chiles are an unusual cultural spice in many ways, chiles apparent universal appeal, the fruits wholehearted integration into virtually every cuisine on the planet is in some ways unique. Smithsonian researchers report that across the Americas, chile peppers were cultivated and traded as early as 6,000 years ago and likely were consumed by the native people in the Ecuadorian rainforests even earlier than that. Today, chiles have managed to integrate themselves into the diet and cuisine of very nearly every continent on the planet. I have been told by a colleague at National Geographic that cultivated chiles have been found being grown by "un-contacted" tribes deep in the Congo, proof to the contrary that these remote tribes are truly un-contacted, as ultimately this spice had its heredity in the equally deep jungles of ancient Ecuador. That Famous European, Columbus, brought chile peppers in several forms back to Europe; from there, Portuguese traders spread them along the coasts of present-day Africa, India, Asia, China, the Middle East, Central Europe and Italy. 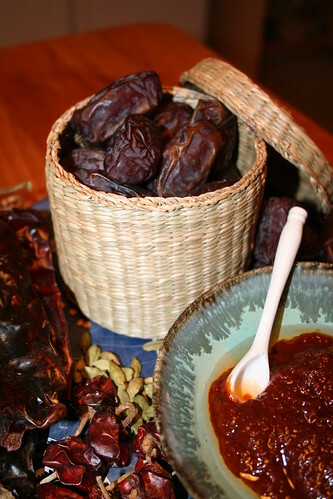 Areas which already consumed a diet rich in highly spiced foods — such as present-day Asia and India — very quickly incorporated chile peppers into their local cuisines; so quickly, in fact, that until the 1900s chile peppers were widely believed to be indigenous to Asia and India — they were not. So on this Columbus day I thought it worth a meditation on the history of the chile, this skilled culinary ambassador, who was set upon the world by another whose legacy is both celebrated and despised. These chili peppers from the Guila Naquitz cave in Oaxaca Mexico date to between A.D. 490 and 780, and represent two cultivars or cultivated types. A Smithsonian scientist analyzed the chili pepper remains and determined that Pre-Columbian inhabitants of the region hundreds of years ago enjoyed a spicy fare similar to Mexican cuisine today. So I am starting with the Santa Fe School of Cooking powders because they come in stainless steel resealable tins. Really it is more like a small paint can, but it's nice. I have been ordering this chile powder from the school's store for 2 years now, and each time I finish a can it is months before I can bring myself to toss out the tin. The tins are really nice.